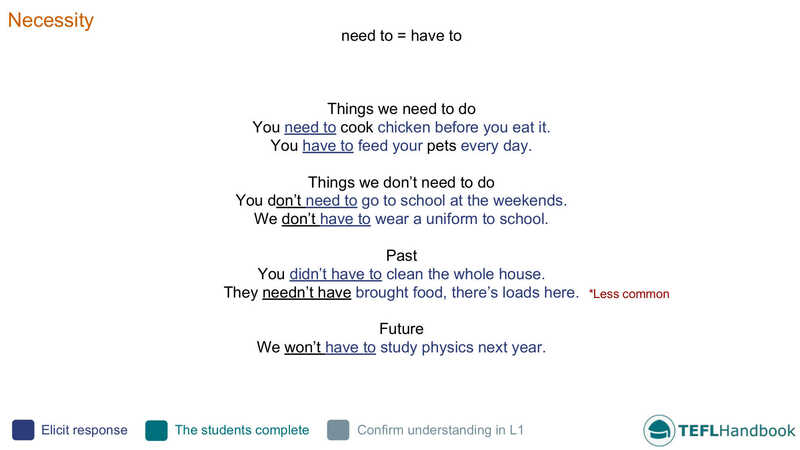 An ESL lesson plan that teaches the different ways of expressing necessity in English. It includes a lead-in activity, along with several activities and games designed for low-resource classrooms. If you need to bring these materials into the classroom for reference, the TEFL Handbook app gives you offline access to all of the ESL resources on this site, plus a lot more. They didn’t have to bring a present to the beach. They should have brought a pair of sunglasses instead. Having a meal in a restaurant. Buying a new pair of jeans. Here is one suggestion for a fun ESL classroom game for practising necessity with elementary level students. As usual, we only use ideas that suit low-resource classrooms. Student A: Do you have to wear a uniform? Student B: Yes, I do. Student A: Are you a policeman? This activity may work better if you elicit and write a list of occupations on the board. We hope that you've found a few of these ideas useful. Our suggested next lesson is on indefinite pronouns. Be sure to check out our complete list of elementary level ESL lesson plans, A2 lower and A2 upper, as well as our entire collection of ESL lesson plans. Also, if you are an iOS or Android user, this lesson plan is available for free on the TEFL Handbook app. 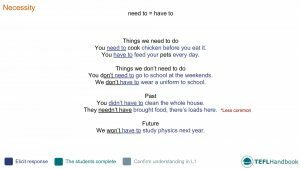 An ESL lesson planner for English teachers.